The £11m Stansted Airport College, designed by Pascall+Watson, is the first on-site college of its kind at any major UK airport and is a joint venture between Harlow College and London Stansted. When the college opens in time for the 2018 autumn term, it will aim to boost the skills of students in the region and provide a pipeline of future talent for the airport and the 200 plus on-site companies. The two-storey facility, located on a one acre site on land made available by the airport, has received two separate £3.5 million grants from the South East Local Enterprise Partnership (SELEP) Local Growth Fund and Essex County Council, and is also supported by a £300,000 grant by Uttlesford District Council. The college will welcome more than 500 students each year and offer courses designed to bridge the skills gap in STEM (Science, Technology, Engineering and Maths) subjects as well as specific airport areas such as aircraft and airport engineering, business studies, logistics and supply chain management, asset management, hospitality and customer service. “Today we have launched our new, modern Industrial Strategy which aims to help young people develop the skills to do the high-paid, high-skilled jobs of the future. “Today is an exciting day for both the airport and the region and we are delighted that the Minister was able to join us all at London Stansted and witness first-hand the role this initiative will play in delivering the Government’s Industrial Strategy. “The Stansted Airport College is a great example of the private and public sector working together on behalf of our region to try to deliver part of the solution to a very real problem. “As a rapidly growing and ambitious airport and employer of 12,000 people, it is vital for us to develop and retain the right talent and skills. 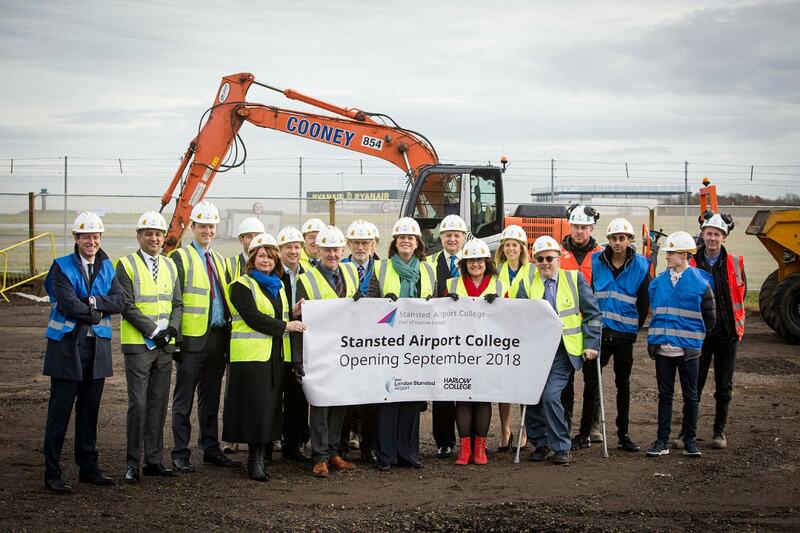 “We are very proud to have helped create this project to build an aviation college at Stansted Airport and we are thrilled to be a key funding partner in this unique venture which will make a great impact on the Essex economy. The college will be a valued and important training facility and will help bridge the technical and engineering skills gap in the county that are identified by the Essex Employment and Skills Board. Our investment supports our bold ambitions to achieve the best for our residents and we are committed to support them to achieve the skills and qualifications they need to reach their potential. “It is vital that we support key economic sectors and businesses like Stansted Airport and our further education providers such as Harlow College. The new college will help the airport access the skills it needs to boost productivity and at the same time generate local employment for our young people.